The end of the plague is always a cause for celebration, even if it ended in 1576. And fortunately, for all of us, the Doge Alvise Mocenigo kept his promise and built the magnificent Church of the Redeemer aka Il Redentore which was consecrated in 1592. Today it is celebrated not only as a religious holiday but the biggest party in Venice – where Venetians actually participate. The car park at Piazzale Roma and Tronchetto are full by midday and the buses and trains coming in to Venice are packed with locals coming into to enjoy the fireworks. The bacino (basin) in front of San Marco is full of locals on boats of every size and shape beginning about 5 p.m. The boats begin arriving laden with food and drinks and they stay until the last barrage of fireworks is lite about midnight. Locals celebrate on the waterfront of Giudecca and San Marco anywhere there is a space with a view of the fireworks. It is like a block party along the waterfront with a kind of pot luck dinner in the neighborhoods. Here’s a few minutes of the fireworks (fuochi d’artificio). I love seeing the gondolas silently rowing through. The cheering and conversations are also enjoyable. If you have a hard time understand some words, some of it is in Venetian dialect. Thanks to my friends in Venice and Lido for the up close pictures taken from his gondola. You can see the outline of the gondola in the pictures above. It still represents a pilgrimage to the citizens of Venice. The city constructs this amazing pontoon bridge each year so Venetian faithfuls can walk across. It is a lot of work to make this bridge that crosses the Giudecca Canal but the crews in Venice are seasoned and they get it done. You can see they take into account the need for the boat traffic as you see the vaporetto just going under the bridge. 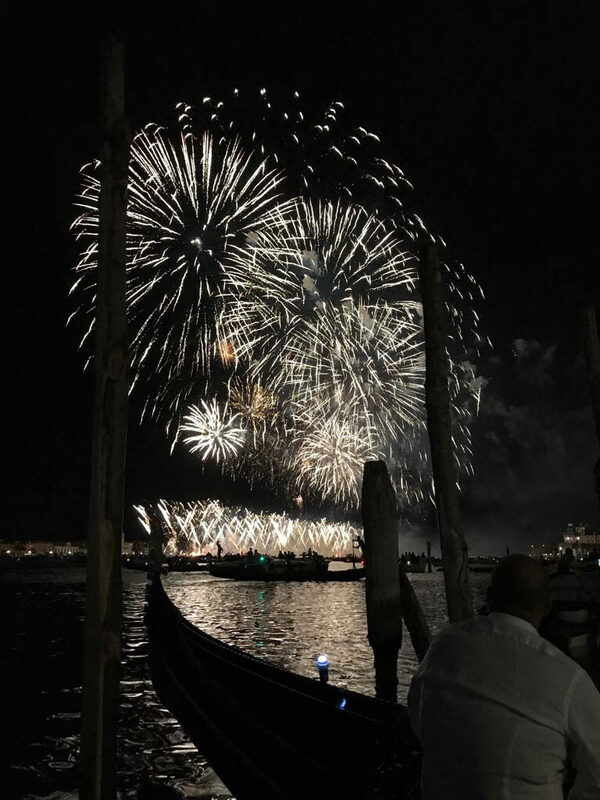 The vaporetti lines are suspended during the fireworks so if you are on Giudecca for the fireworks, the bridge is your fastest way back across to Venice as the vaporetto lines are super crowded when they begin normal operations. The bridge opened at 7 pm Saturday night connecting the Zattere to the Church and remained open until Sunday night. During Sunday night these hardworking crews dismantle the bridge and get ready for the next big pontoon bridge which will be in November for Santa Maria della Salute, a tribute to the end of another plague in 1630. 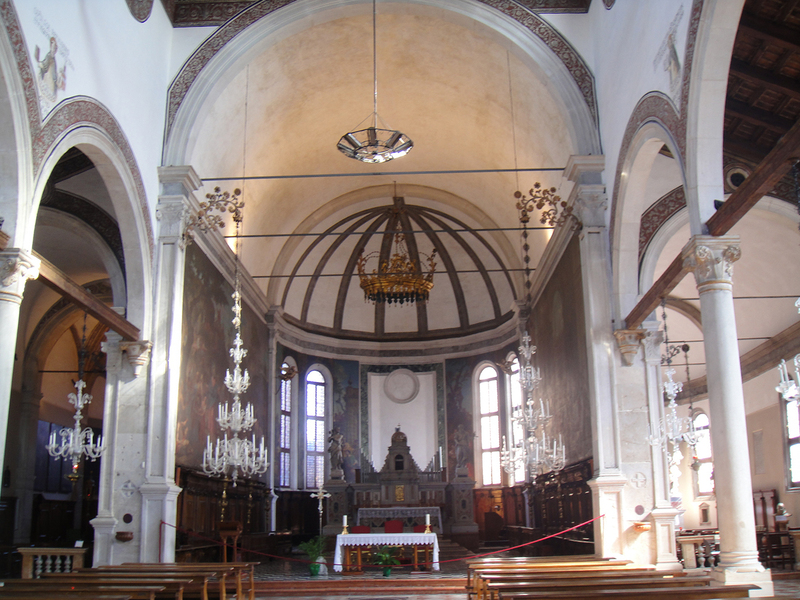 The church was designed by the architect Andrea Palladio. President of the US, Thomas Jefferson admired Palladio’s style of architecture and the US Capitol building in Washington DC is a version of Palladio’s designs. The 111th Congress of the US called Palladio the “Father of American Architecture”. The paintings in the basilica include famous Venetians and Italians of the 16th Century: Francesco Bassano, Lazzaro Bastiani, Carlo Sarceni, Leandro Bassano, Palma, Jacopo Bassano, Francesco Bissolo, Rocco Marconi, Paolo Veronese, Alvise Vivarini and housed the workshop of Tintoretto, a who’s who of famous Venetian painters. This year to celebrate the 450th anniversary of birth of Claudio Monteverdi (1567-1643), there was a concert in the church, performed by Ensemble Musica Venezia. More fun events included a children’s twin-oared “pupparini” boat regatta and gondola races. The final event was the solemn Votive Mass at the chiesa. And for me, they include prosciutto because I have only learned recently to appreciate the finer qualities of Baccalà Mantecato and am still working on developing the love of Sarde in Saor or the Scampi version, though I love the shrimp when they fry them before inundating them with vinegar and onions for the required 2 days of soaking! Who doesn’t love a sweet fried shrimp?